Which of these weight-losers will help your portfolio gain? 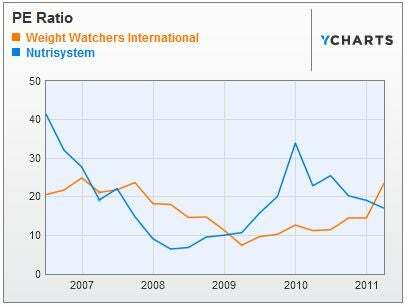 Shares of Weight Watchers (NYSE: WTW) and Nutrisystem (Nasdaq: NTRI) used to move together, yo-yoing up and down with the economy like a chronic dieter's weight. But the two stocks dramatically went their separate ways earlier this year, as Weight Watchers rolled out a popular new points program for the 1.2 million people who weekly attend its meetings, and Nutrisystem was left to deeply discount its mail-order food shipments to avoid being forgotten altogether. Weight Watchers spent the early months of 2011 upwardly adjusting its earnings guidance for the year, while Nutrisystem was adjusting its downward. So, which company to buy -- the newly ascendant Weight Watchers, trading at a lofty multiple, or the down-on-its-luck Nutrisystem, cheap by some measures but struggling to remain relevant? 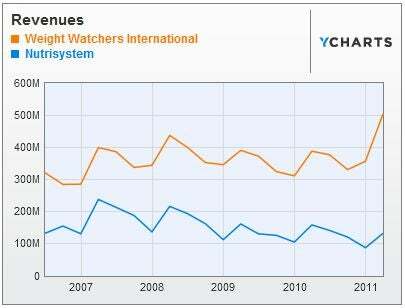 YCharts Pro is neutral on Weight Watchers, because of its price and to a somewhat-leveraged balance sheet, but finds Nutrisystem attractive, comparing its current performance to prior periods in which revenue and profit were larger. But our advice is to avoid them both for now, but keep an eye out for major changes. 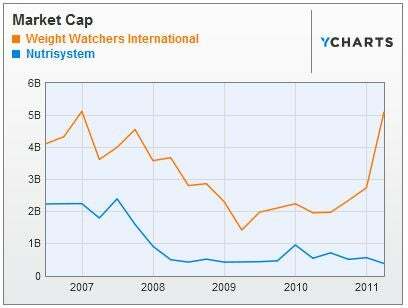 If Weight Watchers shares fall back after its growth levels off, at a lower valuation, it could be attractive. The company appears smartly managed and unafraid to take some risks to expand its market share under CEO David Kirchhoff. And should Nutrisystem appear to be getting its act together, halting a decline in sales and margins, jumping on the stock quickly could provide a nice gain. Nutrisystem estimates 96 million Americans are dieting at any one time, but only 8% of those are enrolled in some commercial weight-loss program. Two-thirds of Americans are overweight, and one half of those people are classified as obese. Big market. Nutrisystem is the low-cost business model, selling calorie-counted food via the Internet and call centers and employing fewer 1,000 people; it's all anonymous. Weight Watchers is a huge cult, employing 26,000 to run weekly, hour-long meetings where paying members discuss dieting and other weight issues, often in deeply personal ways. And in this age of tell-all, the Weight Watchers approach appears to be winning. Both run massive marketing operations to attract new customers, as the dropout rate is understandably high. Nutrisystem says its typical customer is a 49-year-old woman who wants to drop 44 of her 187 pounds. She usually attains only a portion of that goal, sticking around for 10-to-11 weeks, and losing 1-to-2 pounds per week. First-quarter revenue at Nutrisystem, in the face of the Weight Watchers juggernaut, fell 16% to $132.7 million. And the falloff led to a net loss. Nutrisystem had to slash its prices to levels not seen since 2003 to avoid a bigger sales plunge. Weight Watchers, meanwhile, saw first-quarter revenue soar 30% to $503.4 million. And net income leapt 65% to $73.6 million, or $1.00 a diluted share. Weight Watchers twice raised its projection for 2011 profit, now in the range of $3.75-to-$4.00 a share. At that level, the P/E ratio looks more like 20 or 21, instead of the trailing-12-months' 27 and change. It's still high, however, for a company that typically grows more slowly. A new diet pill from some pharmaceutical company, of course, could cause a stampede away from both these companies. But professionally managed dieting seems here to stay, and these companies both have great name recognition. Finding the right time to buy is the key. Jeff Bailey is an editor for the YCharts Pro Investor Service.